Last Sunday morning at CRBC I preached a sermon on the last four verses of Luke’s Gospel (Luke 24:50-53), the 100th message in a sermon series through the Gospel of Luke. The series (all 100 messages here) began on June 3, 2012 with a message on Luke 1:1-4, titled “Those things most surely believed among us.” There were a few breaks along the way, including a parallel series through Galatians. I still believe that systematic expositional preaching of the Scriptures is the key means both for evangelizing and for discipleship. I was recently encouraged when a CRBC-er who began regular attendance about the time we started this series, noted his appreciation for the familiarity he now has with Luke’s Gospel and how it has helped him understand Christ and the faith better. SDG. 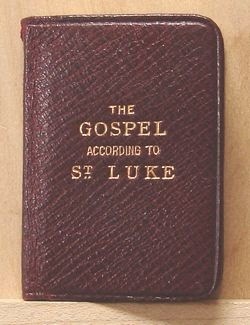 At the start of the last message I called attention to how Luke began in the introduction (Luke 1:1-4) by stating that he wrote this Gospel in order to reinforce in “most excellent Theophilus” (Luke 1:3) and in all his hearers “the certainty of those things, wherein thou hast been instructed” (Luke 1:4). Whereas John seems to state that the purpose of his Gospel was evangelism (cf. John 20:31: “But these are written, that ye might believe that Jesus is the Christ, the Son of God; and that believing ye might have life through his name.”), Luke seems to have as his original purpose discipleship. That said, there is no doubt that in the larger purpose of God, both John and Luke (and all the Gospels) have proven useful both for evangelism and for discipleship. Luke begins with angels and shepherds worshipping at the birth of Jesus (Luke 2:14, 20), and it ends with the apostles worshipping him at his ascension (Luke 24:52: “And they worshipped him…”). From beginning to end it summons its hearers to worship the Lord Jesus Christ.